Fluoramics recently introduced new grease cartridges for two of its best-selling Tufoil products: High Temperature Spindle Grease and Lightning Grease. The new cartridges can fit mini and standard grease guns and are designed to enable cleaner and faster application of the two lubricants. Fluoramics’ High Temperature Spindle Grease is widely used to lubricate high-speed rotating machinery, drills, appliance motors and brake calipers. The odorless lubricant is based on colloids of polytetrafluoroethylene (PTFE) and soluble molybdenum. With no melting point and an unlimited shelf life, the grease is stable in excessive heat and will not melt or run, even in a direct flame. It is available in 3- and 14-ounce cartridges, as well as ¼-, ½- or 1-pound jars. 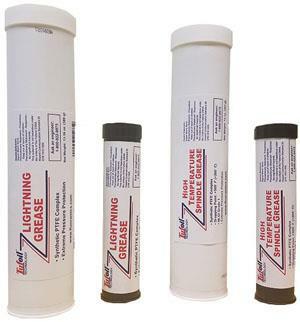 Lightning Grease is a jelled version of Tufoil formulated to significantly lower the operating temperature of equipment and extend the life of crucial machine parts. It is intended for lubricating gears, bearings, steppers and robotic systems. The new cartridge is engineered to make it easier to lubricate high-pressure roller bearings where Zerk fittings are used. The grease is now available in 125-gram tubes, 3- and 13.39-ounce cartridges, as well as ¼-, ½- or 1-pound jars. For more information, visit www.Fluoramics.com.